With over 30 years of substation installation and maintenance experience, you can trust ERTH has the knowledge and expertise to meet your high voltage and low voltage needs. ERTH is pleased to offer high voltage and low voltage services including substation inspection, maintenance and repair. With several regular utility customers and over 30 years of experience, you can be rest assured that ERTH has the knowledge and expertise to exceed your expectations. Why Choose ERTH’s High Voltage and Low Voltage Services? 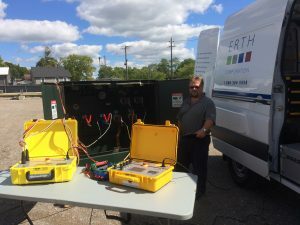 ERTH’s services division was created through the need to provide high voltage and low voltage services for its affiliated utility, now Erie Thames Powerlines. Since then, the services have grown to continue supporting an evolving industry. With our experience, you can trust that ERTH has the knowledge and expertise to complete turnkey projects from grid connection to customer service. While others can provide similar services, ERTH is your one-stop shop for all electrical needs. In addition to high voltage and low voltage services, ERTH can provide pole line construction and maintenance, metering (including meter verification and meter point services), electricians, and everything else you need to ensure a reliable flow of power. Connections you can count on – call us today to discuss your specific needs.